Flavio Macedo is a Visual Artist. My first experience with painting occurred in my father's studio, who is also a painter, with these impressions I knew I wanted to go the way of art. 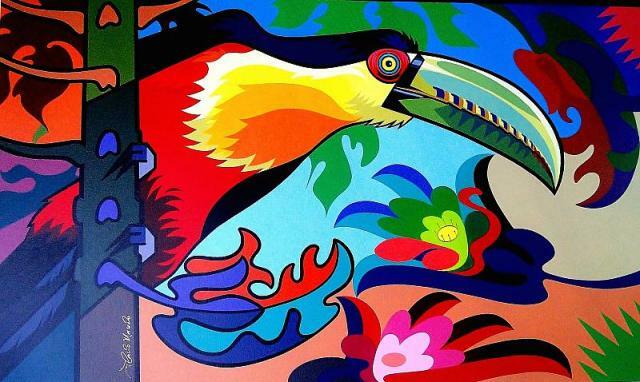 I am self-taught in academic drawing, Art and Painting, but a few years I have been working with Pop style, because I think the style that can best capture the vibrant colors of the wildlife, the flora, Indians, or the Brazilian culture, the name of my theme is EXOBRASILVESTRE. Working with these reasons, exploring light and the infinite possibilities of acrylic paint and valuing the black outline´s handmade . I'm in a very long-winded phase, My inspiration is always based on the nature, inexhaustible source of inspiration.